Certain flowers in large colonies were most popular over several days and both sexes were observed feeding on the boss, which suggests a food-related attraction. Virtually nothing was known about the Corybas pollinators and primary literature to date only offered hypotheses. 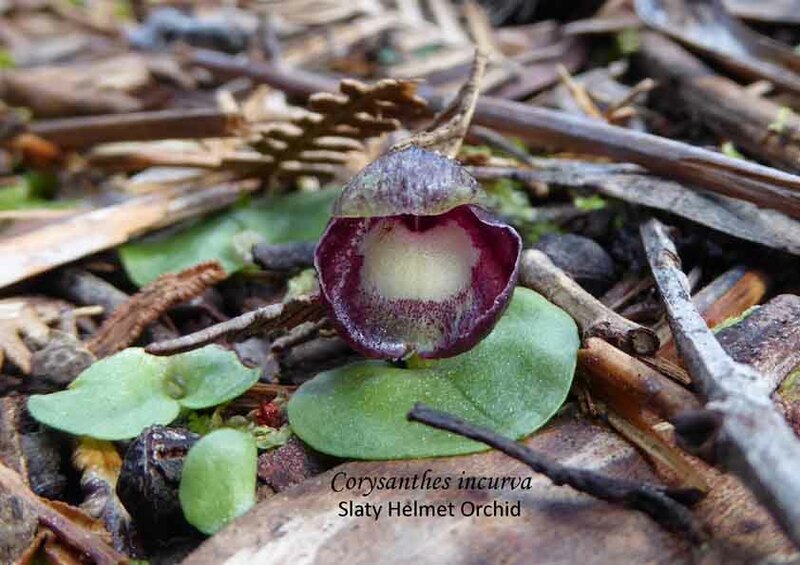 Based on our findings, the persisting statement in literature that ‘Corybas species attract fungus-gnats as putative brood-sites’ is incorrect for the taxa in Victoria. No evidence of ovipositing in flowers was found. Females feeding looked gravid and were presumed to be unfertilised. All individuals looked fresh with undamaged wings and it was apparent they had recently hatched. Is this a hypotheses that needs revising? Rudie definitely demonstrates the importance of careful and meticulous observations. 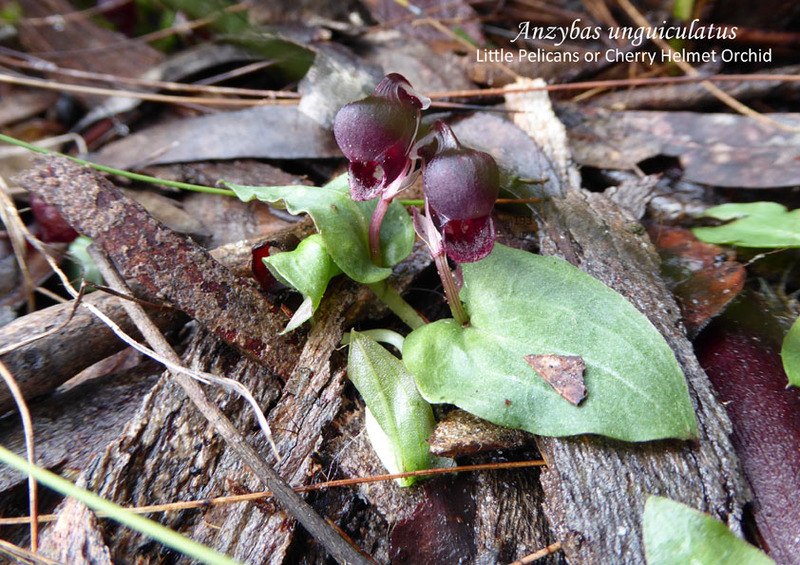 Anzybas unguiculatas (common name Little Pelican or Cherry Helmet Orchid) was the main focus for this month’s competition with three photographs of this diminutive flower. The other photographs were Ed Lowrey’s close-up of a triggered Urochilus sanguineus labellum, John Badger’s first Diuris palustris sighting for this year and Pauline Meyer’s mass flowering of Leptoceras menziesii post fire. Of the Anzybas, Jenny Pauley entered two and Lorraine Badger one. Jenny Pauley’s photograph of two flowers was the outstanding winner. 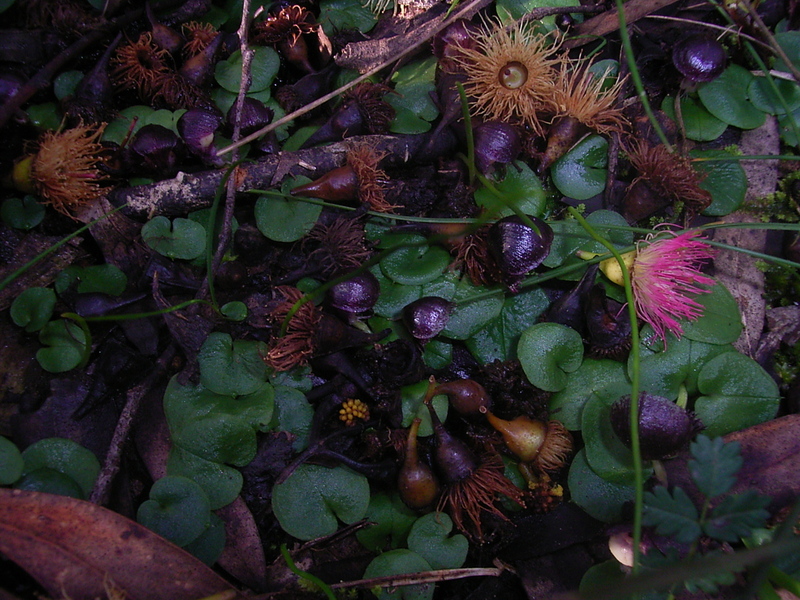 Originally named Corysanthes unguiculata (1810), then Corybas unguiculatus (1871), the genus name was changed in 2002 to Anzybas in recognition of its distribution both in Australia in New Zealand. Since 1945 it had been recognised that the New Zealand species Corybas cheesemanii was a synonym for Corybas unguiculatas although the juvenile plant can have two leaves unlike the Australian species which is single leafed. An interesting feature of this flower is the prominent white ears at the rear of the helmet (not clearly seen in this photograph) which are part of the labellum. These plants are small. 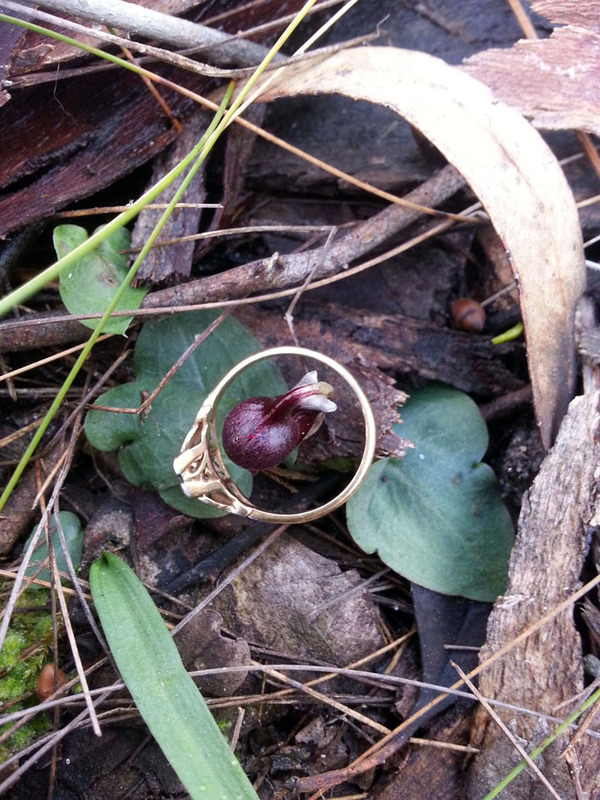 The gum leaves and twigs give an idea of size but the engagement ring shows it very clearly. Note also the prominent ‘white ears’ of the labellum. An unusual aspect of this photograph is that the colour of the underside of one of the leaves. It lacks the characteristic distinguishing feature of the purple underside of the leaves. According to orchid growers, the light affects the leaf colour. Heavy shade produces green leaves. It is possible that the heavy leaf litter where this plant was growing provided enough deep shade to cause the colour loss. Bates (1990) states that it (has) not proved amenable to cultivation, but it has, on rare occasions, been benched at NOSSA meetings with the most recent occurrence was in July 2010 but it remains a very difficult plant to cultivate. The electronic version Vol 34 No 7 has a photograph of the plant just visible within the moss. It is not always easy to photograph this species as not only is it rare with limited numbers but there are very few sites where it can be found. Added to that is that the window of opportunity is short in South Australia with a flowering time from June to August compared with those interstate which can range from May to October. This postcard is held by the State Library of Victoria. Although the distribution covers the Southern Lofty, Kangaroo Island and the South East regions of South Australia, it has become increasingly rare due to loss of habitat which consists of leaf litter on damp soils. As a result, there are very limited localities where they can now be found. It is one of our earliest helmets to flower which is from June to July. 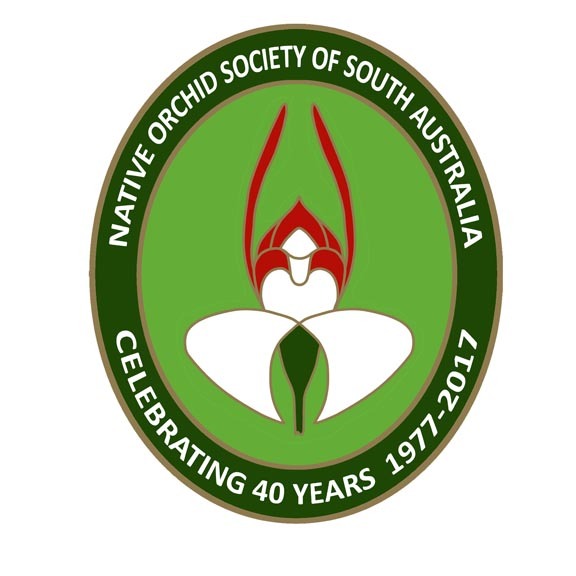 Jones, David L (2006) Native Orchids of Australasia, Frenchs Forest, NSW: Reed New Holland.